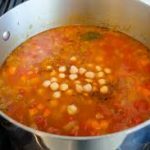 This chick peas and tomatoes recipe has the consistency of a good, rich spoon soup. This would really be good with our basic-no-knead-flat-bread-recipe. Heat oil in a large saucepan over moderate heat. Add onion and garlic, saute for 5 minutes, then mix in the thyme, oregano, chic-peas and tomatoes. Reduce heat to low, cover and simmer 30 minutes, salt and pepper to taste. Mix in parsley and mint and serve.